We had meant to be packed up and ready to go for Tuesday, our last day with Chris and Amy. But we had always found things to do that were more pleasant and more interesting than packing up. So Tuesday morning came with a bit of a scramble, and we weren’t quite all ready. 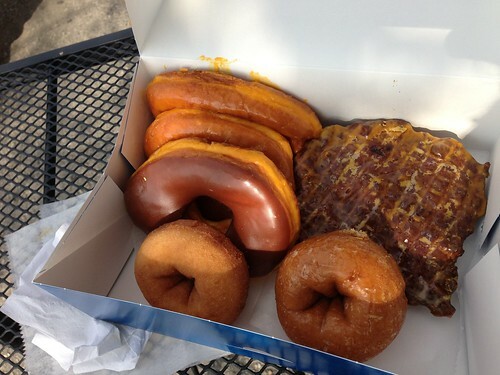 So in a tradeoff, we left Lori to finish packing while we went to get donuts, with a promise to return with donuts to her. 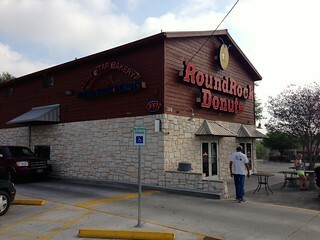 Our destination was another Roadfood-listed donut shop: Round Rock Donuts. 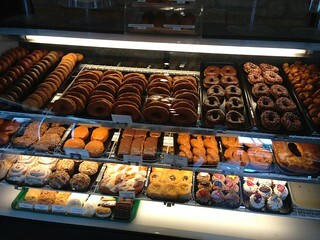 It’s rare for me to be be really impressed one way or another by a donut, and these donuts were no exception. We bought a variety, but we ended up giving most of them away. The most distinctive quality of these donuts was the glaze, which had a distinct yellow tinge (though I didn’t notice a distinctive taste). We bought one token kolache, because we had missed two previous plans for Austin-area kolaches. I sample kolaches everywhere I find them, but I haven’t yet found a kolache I’ve really loved. Even so, I don’t think this was among the better kolaches I’ve had.